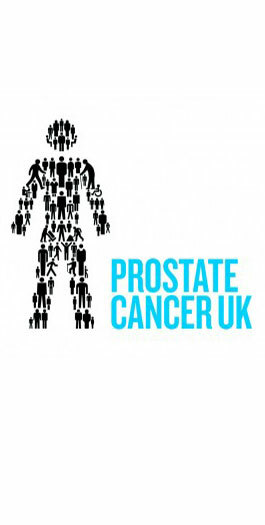 On Saturday 14th June 2014 John Parr performed as part of a very special U.K. charity event which raised money for the fight against prostate cancer. 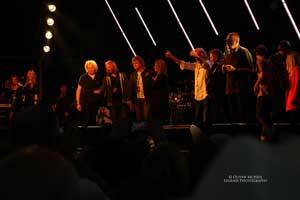 John was part of a lineup of well-known musicians that hit the stage during the Rock 'n' Horsepower benefit, which took place at the Hurtwood Park Polo Club in Surrey, England. 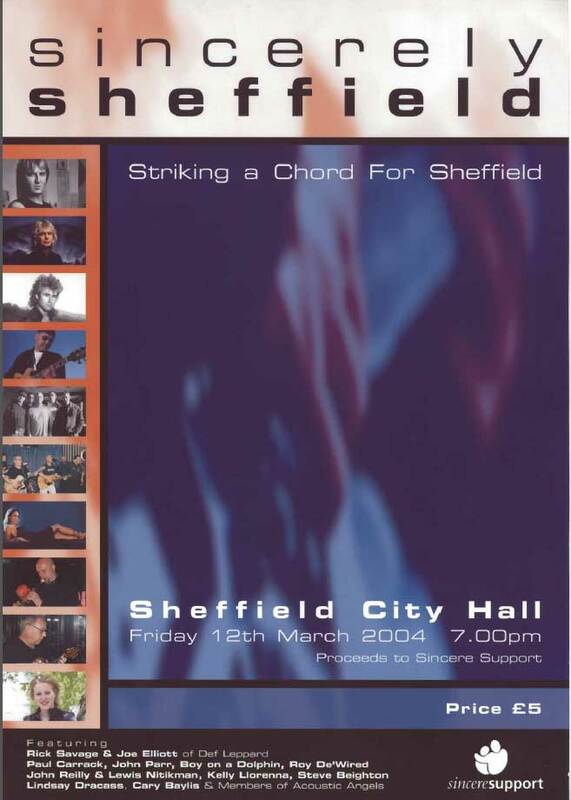 Other famous artists on the bill included Jeff Beck, Simply Red singer Mick Hucknall, Genesis and Mike & the Mechanics member Mike Rutherford, The Moody Blues' John Lodge, ex-Foreigner bassist Rick Wills and Who band mates Roger Daltry, Pete Towshend and Kenny Jones. The star-studded concert will serve as the finale of the daylong event, which also featured polo matches, an exhibition of vintage cars, a VIP luncheon, a charity auction and prize giveaways. 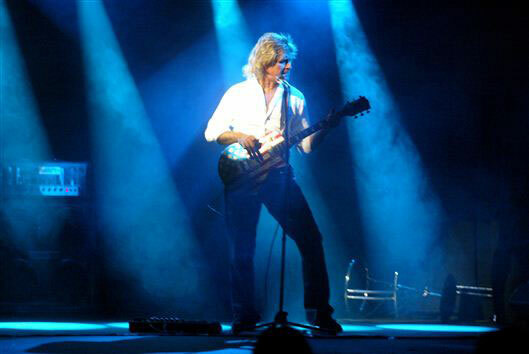 Local based pop-rock star John Parr is to headline the first ever DN7 Festival. John won world wide acclaim in the 1980’s with hits that included ‘St. Elmo’s Fire’ and ‘Naughty Naughty’ which was No. 1 in America. 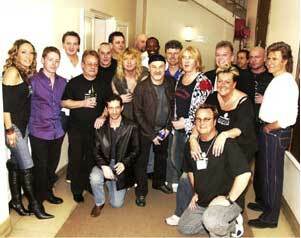 Over the years John has toured with top artists including Tina Turner and The Beach Boys. He has written or contributed to songs performed by a wide variety of artists including Meatloaf, Tom Jones and Roger Daltry. After a period out of the music business, John returned in 2007 and joined Canadian pop-rock artist Bryan Adams on his tour. In 2011 John released his latest album “Letter to America” and toured the United States extensively throughout 2012. 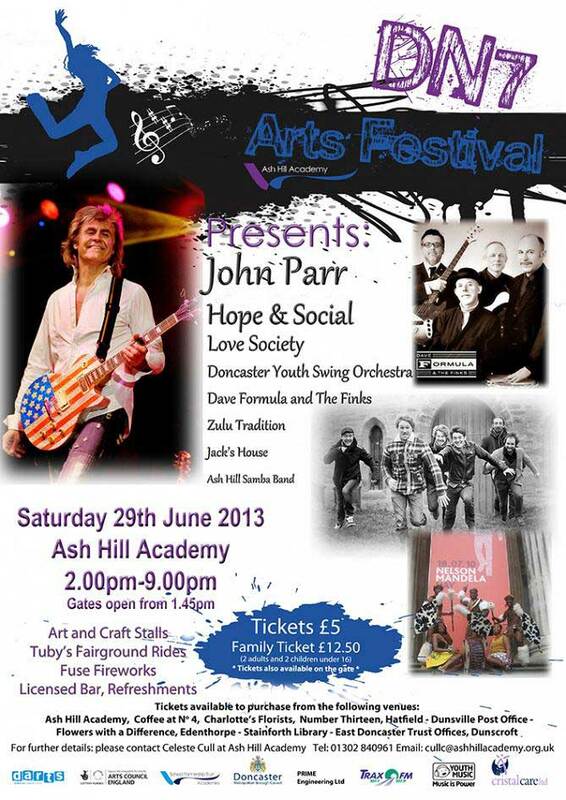 John has a long association with the school and we are delighted that he has agreed to headline what should be a fantastic day for our community. The DN7 Festival is a week-long event beginning on Monday 24th June and ending with a spectacular outdoor event in the Academy grounds on Saturday 29th June. On the Saturday a varied programme of entertainment has been assembled which includes performances from: • Jack’s House (Young local band) • Dave Formula and the Finks (Doncaster band) • Doncaster Youth Swing Orchestra • Love Society (Fantastic South African Rock Music) • Hope and Social (Regarded as one of the best live bands in the area) • John Parr (local based Rock Star, famous for his Number 1 hits “Naughty, Naughty” and “St Elmo’s Fire”) Trax FM will be presenting the outdoor staged events. 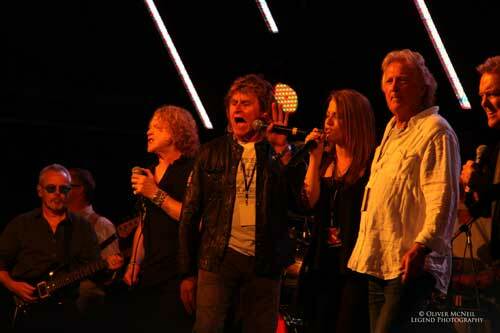 John Parr joins "Rewind - The 80's Festival" in the UK, summer 2012. The festival kicks off at Scone Palace, Scotland 20th - 22nd July 2012 with a second venue at Henley-On-Thames, London 17th - 19th August 2012. 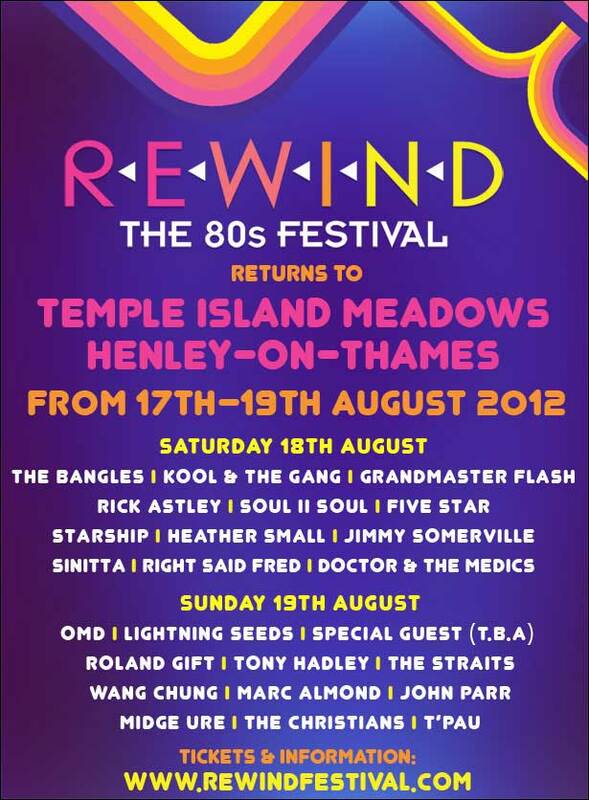 “Rewind – The 80s Festival” returns for its fourth year following last year's unforgettable concert performances and audience participation celebrations, this years Rewind Festival includes another incredible live outdoor line-up of the crème de la crème of 80s recording artists/performers. 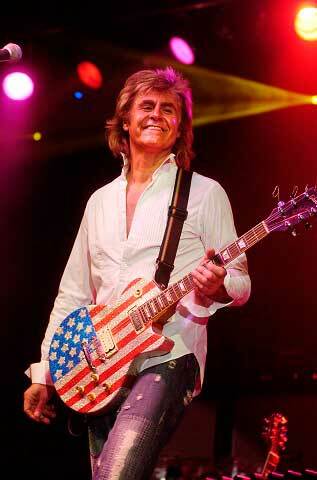 Few musicians from England have made such a mark on America as John Parr has. He first found fame in America with the song he is probably best known for, "St. Elmo's Fire (Man in Motion)," the popular 80s tune that he wrote and performed for the iconic film of the same name. Around that same time, he had another hit song that climbed the charts, called "Naughty, Naughty." As a Grammy-nominated singer-songwriter, he has enjoyed a long and successful career, selling more than 10 million albums and working with a variety of top names including Tina Turner, Bryan Adams, Meatloaf, Journey and The Beach Boys. 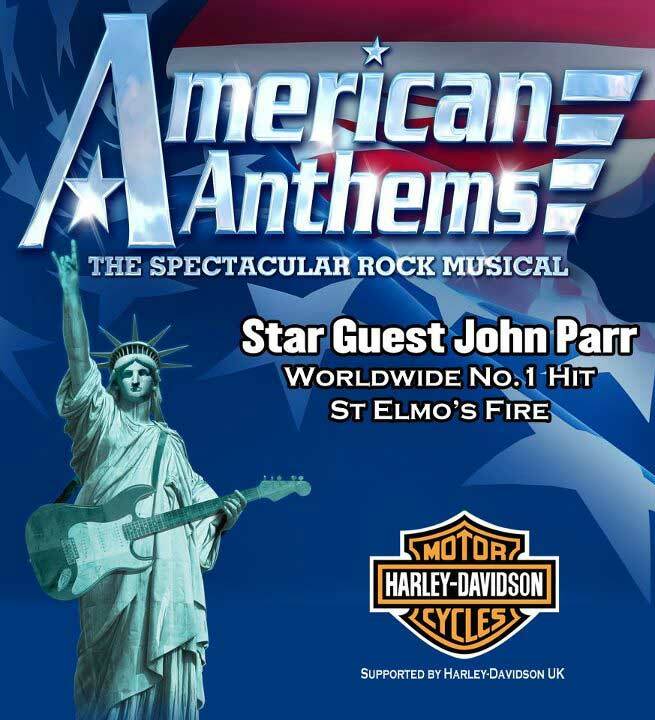 Produced in association with Harley-Davidson, American Anthems is the Spectacular Rock Musical based around the search for a legendary rock star who disappeared in the early 90’s at the height of his fame. Route 66 FM leads the search for the rock star, Rocky Rhodes, tracking him across America to bring him back for one last concert. The show encapsulates the most Iconic American music featuring artists such as Bruce Springsteen, Bon Jovi, Eagles, Elvis, Bryan Adams, Michael Bolton, and including such songs as Walking in Memphis, We Built This City, Bat out of Hell, Born to Run, America, St Elmo’s Fire, Sweet Child of Mine, Proud Mary, and many more. 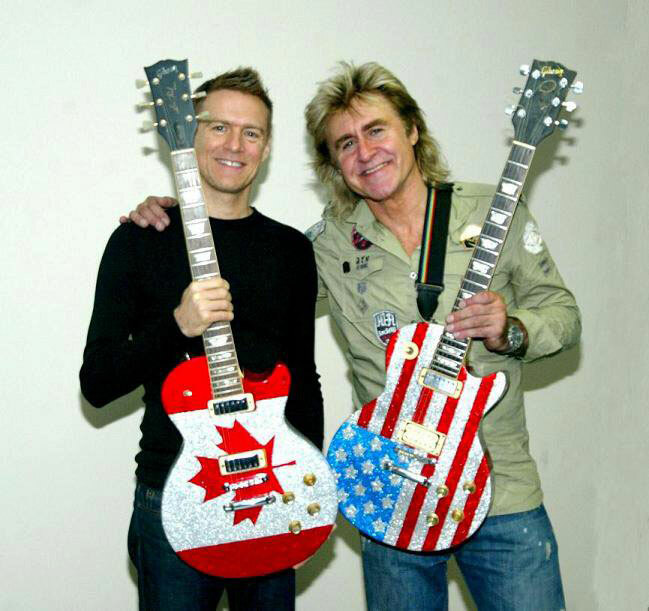 Appearing as a guest star is the legendary John Parr, who had a worldwide No.1 hit with “St Elmo’s Fire.” John has toured with Richard Marx, Journey, and Bryan Adams in 2011, and has just released his 5th Album titled “Letter to America”. 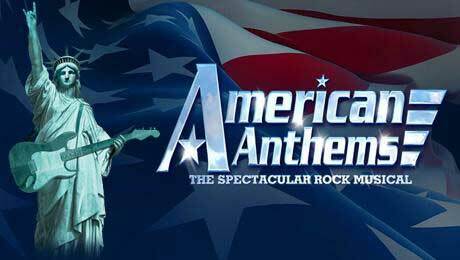 Featuring a sensational cast of singers, dancers and musicians, this Spectacular Rock Musical promises to be the rock show of the year, recapturing the memories of America’s most iconic music. 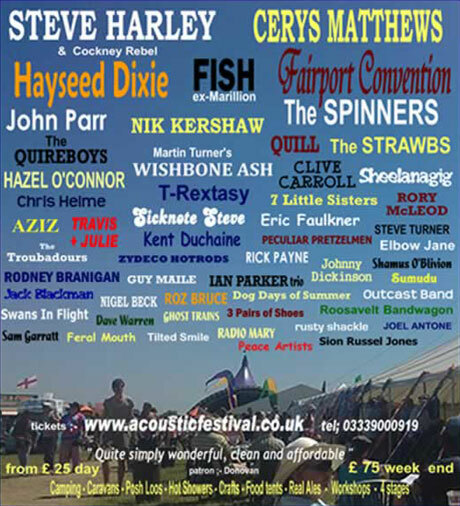 The Acoustic Festival of Britain offers four stages of unplugged and acoustic music covering live folk guitar music, country music, bluegrass, with a few legends, and some tribute acts. now in it's sixth year the festival is held from Friday 20th until Sunday 22nd May 2011 at Uttoxeter Racecourse, in Staffordshire. Steve Harley will headline Saturday night, Hayseed Dixie, and Cerys Matthews have been announced as Friday night headliners, with Fairport Convention, Nik Kershaw, and Quill announced for Sunday, with John Parr, Fish, Sheelanagig, Martin Turner's Wishbone Ash, Hazel O'Connor & The Bluja Project, The Acoustic Beatles, The Troubadors, Elbow Jane, Radio Mary, Ghost Train, The Re-entrants, Shamus OBlivion, T.Rextasy, Seven Little Sisters, and more also confirmed. Dancing through the weekend will include The Shimmy Armageddon Belly Dancers, The Black Pig Border Morris Dancers, Zazutribal Dancers, The Biker Urban Morris Dancers and The Balimino Dancers. 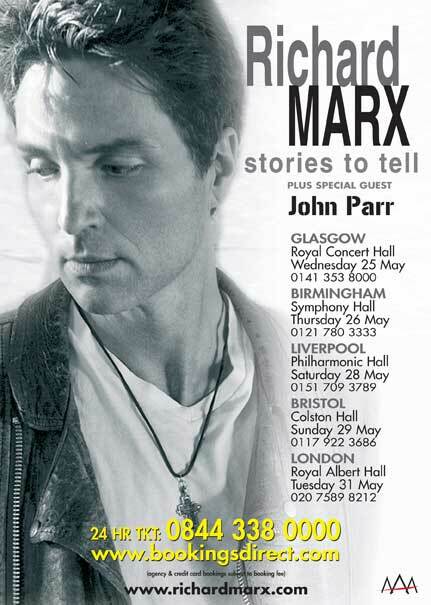 During 2011 John Parr joined Richard Marx on a five date tour of the UK. 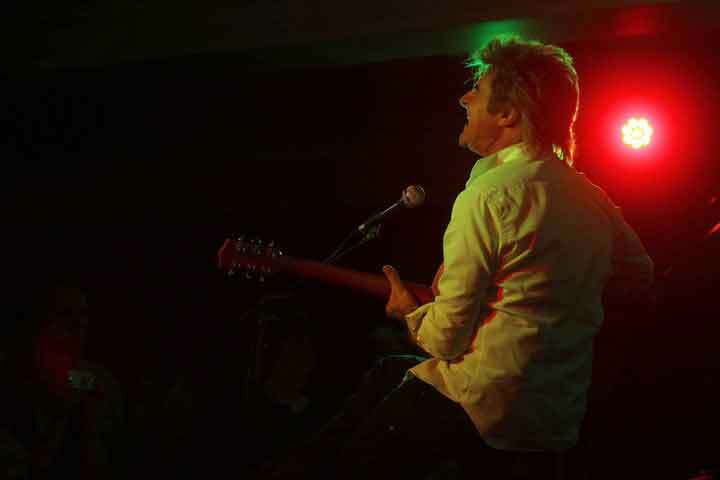 Known for his big hits “St Elmo’s Fire” and “Naughty Naughty” John Parr, like Richard Marx, has also collaborated with great artists and producers like Meat Loaf, Roger Daltrey, Tom Jones, John “MUTT” Lange and has written some few big film sound tracks too. As support for Richard Marx, Parr's set was fully acoustic highlighting that not only is he a great singer but also a very accomplished guitarist. Between each song he gave a detailed description and insight into how the songs came about. Favourites such as “Naught Naughty” and surprise hits such as “The Best A Man Can Get” (the Gillette shaving ad song!). Next was a new song from his upcoming release “Letter To America” a moving tribute to war heroes called “At The Cathederal”. The set was completed with Parr giving the real back story behind the iconic hit “St. Elmo's Fire” which resulted in standing ovations at each venue. Later during the main performance Richard Marx reinvited John Parr back on stage to perform a song as a duo “Like Brothers”, which they claim to have written that rainy afternoon!! 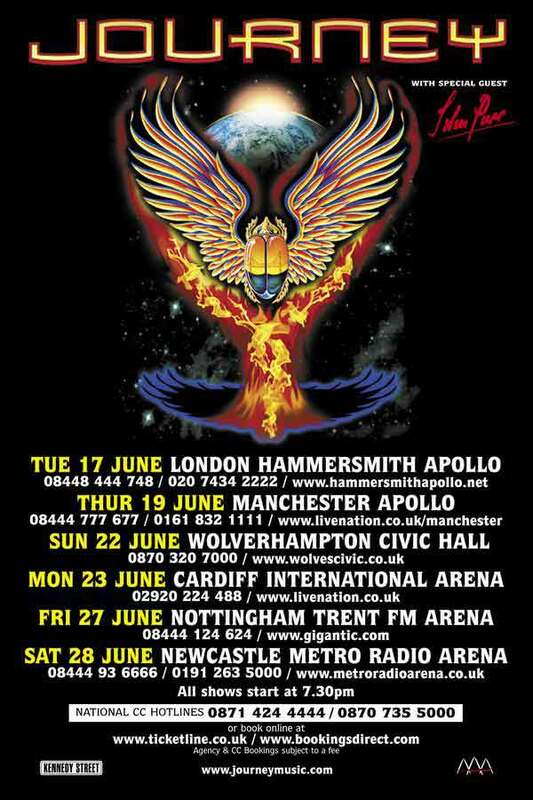 John Parr confirmed as special guest to Legendary rockers - Journey. 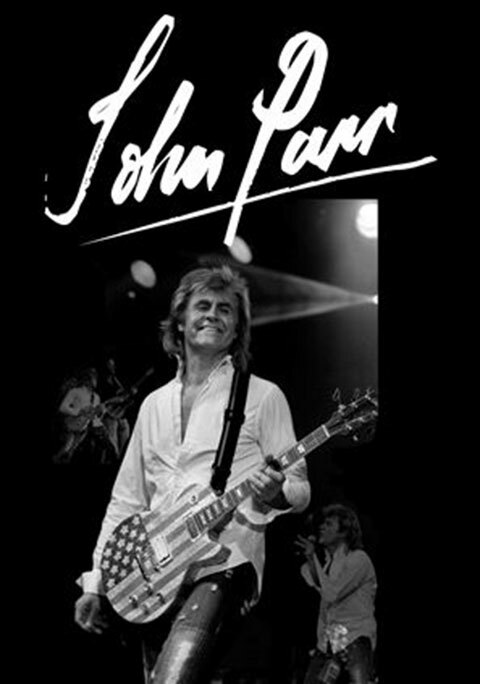 'Naughty Naughty' was John Parr's first U.S. top 40 hit record achieving the number 1 on every rock radio station in America for up to 12 weeks. John then had one of the biggest hits of the 80's with his iconic track 'St Elmo's Fire (Man In Motion)' which was No.1 around the World, and achieved great success for John in the U.S. He went on to have other hits such as 'Restless Heart', 'Rock & Roll Mercenaries' etc. Parr has played shows all over the World (including sell out concerts in the UK, US & Canada), at major venues such as Madison Square Garden and the Sydney Opera House. 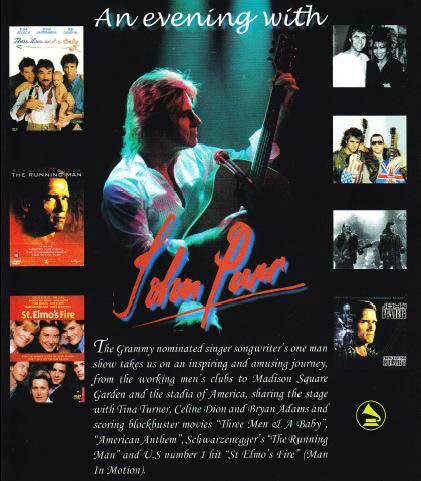 John has performed the music to 9 Major Motion Pictures titles including '3 Men & A Baby', 'The Running Man', 'Near Dark' and of course 'St Elmo's Fire' as well as having tracks covered by International artists including Tom Jones, Meatloaf, Roger Daltry and The Monkees. Parr also toured internationally alongside Bryan Adams, Tina Turner, Toto, and Heart - and has also performed duets with Celine Dion and his good friend Meatloaf. Following a resurgence in popularity of their 1981 hit “Don't Stop Believing”, Journey are embarking on a new Journey with a new lead singer Arnel Pineda. He replaces Jeff Scott Soto, who parted ways with the band in 2007 after stepping in for Steve Augeri, who had to leave the band in 2006 for medical reasons. 'Don't Stop Believing' made appearances in The Wedding Singer, Monster, Shrek, Scrubs, and appeared on both Family Guy and Laguna Beach in the same week.The song was used during the opening sequence of the 59th Primetime Emmy Awards, campaign video for Hillary Clinton and the final scenes in the Sopranos. What a bill! 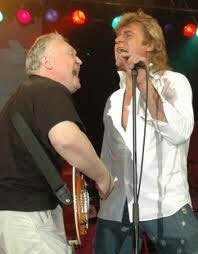 The two Johns proved themselves again to be two of Britain’s finest, criminally overlooked frontmen. Parr’s half-hour solo acoustic set kicked off with the stompingly strummed Coming To The Borderline, before his Gillette cut (ouch), the impassioned The Best A Man Can Get, and roadhouse hit, Naughty Naughty. At The Cathedral was a haunting war protest, and a cover of Fleetwood Mac’s Oh Well led into the classic St. Elmo’s Fire. Waite and his three cohorts followed in electric fashion, in every sense. Their 16-song, 80-minute set demonstrated the depth of his writing talent, solo corkers interspersed with the odd classic from Bad English (a searing Best Of What I Got) and The Babys (the romping Back On My Feet Again). Among the solo spectaculars were the new and Bad Company-esque Evil, a swaggering Mr. Wonderful and, with John on guitar, In Dreams. The New York Dolls homage, Down Town, bore measured bite, new US 7” If Ever You Get Lonely treads a similar path to Foreigner, and Rough And Tumble shook things up before an encore of The Babys’ Head First..
Tim Jones - www.recordcollectormag.com (2011). Dave had intended to start his own charity when he recovered from his illness and had already come up with the name “Help A Child Have A Chance”. Unfortunately though he did not have the chance to fulfil his dream so his widow and two daughters have set up “Help A Child Have A Chance” in his memory and want to continue Dave's great fundraising work and legacy in the region. The fantastic Keepmoat Stadium will played host to its very first concert on July 19 2007 when pop sensations McFly and Ronan Keating teamed up for a fantastic evening of entertainment and great songs, all in the outdoor setting of the town's superb multi-purpose community stadium. That was followed a day later with another magnificent show when Canadian rocker Bryan Adams performed some of his greatest hits with support from homegrown rocker John Parr. Parr dressed in his trademark rocker outfit of torn jeans, white shirt and stars and stripes guitar, he appears - and he's ready to rock. Not afraid to throw the appropriate rock god shapes, he rattles through a few of his more familiar numbers Naughty Naughty, The Best A Man Can Get (the music from the Gillette ads which is dedicated to Toll Bar flood victims), Rovers anthem Walking Out Of The Darkness and of course, a finale of his best-known effort, St Elmo's Fire which gets a damp crowd nicely warmed up. My last show was in front of 20,000 people at Madison Square Garden with Roger Daltry and Yoko Ono, so how come I’m coming to your village hall….? In the twenty years I had lived in my village, I’d seen the school close, the post office, then the pub and the village shop, until only the last bastion of village life remained…. the blessed village hall – sadly still locked cosily in the last century, frequented only by the parish council, the WI, line dancing and occasional “family do”. I decided to do something…. and so “The Pretty Village tour” is my small way of trying to breath a little life back into these great little places by putting on a bit of real entertainment, sharing a few stories, a few laughs and hopefully inspiring a few people who still dare to dream, along the way. The show is intimate and personal, the kind of thing I did when I started out in this business. If you were going to see your favourite artist and you could choose the venue, would it be the Arena, or a small intimate place with just a few friends….? MUSIC WORLD famous rock musician John Parr is to relaunch his singing career after a seven-year sabbatical in the world of film-making. And it is his performance at HotHouse06 that has inspired his return to his musical roots. John Parr the rock musician and songwriter has spent the past seven years transforming himself into John Parr the successful screenwriter and film producer. The Doncaster boy made very, very good who came back to live in his home town proved to be a man of many talents. Abandoning the musical career that made him world famous, he set up film production company Paromack Pictures with local comedian Steve Womack. But John's involvement with HotHouse has proved to be a big turning point in his life. John has tried to avoid big tours since he left the USA to return to live in Doncaster with his wife, Sharon, and has been a hands-on dad for his two sons but now feels he can go back on the road. The Doncaster pair took a short film, Road to Damascus, to within a whisker of winning an Oscar at last year's Academy Awards, making it into the final 12. But it's back to his musical roots for his appearance at the HotHouse festival in the appropriately-named Local Heroes concert which he hopes will be inspirational for local youngsters. “Local Heroes will be a very special event for me," he said. "It will be the first proper concert I have done in England for many years." Steve Womack will start the concert demonstrating his little-known talent as a single-songwriter. 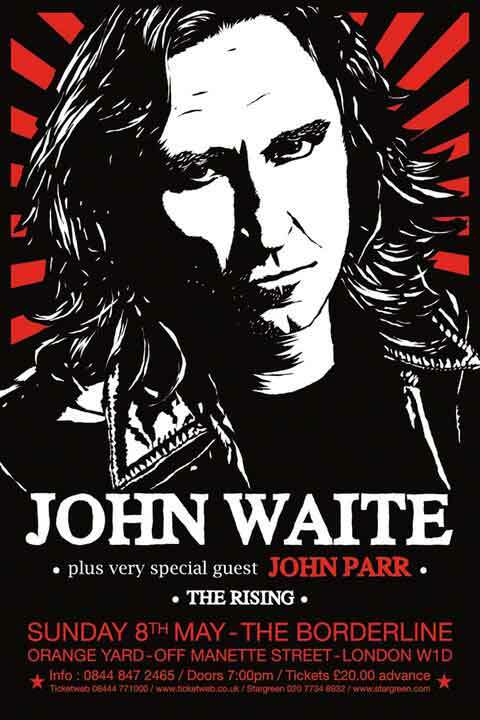 John will follow with the rock show he is best known for, including his top ten hit St Elmo's Fire, and some of the music he has composed for films such as Three Men and a Baby and The Running Man which he has never performed live. John has been involved with the Doncaster festival scene since it started three years ago and was responsible for The Race, a unique event which saw film projected onto the buildings of Priory Walk set to music composed by John, as part of the 2004 D-Frost festival. “HotHouse gives a focus, particularly to the younger generation who think nothing happens in Doncaster,” he said. Make me smile by Cockney Rebel might not be a track normally associated with rock icons Def Leppard. Neither Bowie’s Suffragette City, T Rex classic 20th Century Boy or Winter Song by Lindisfarne! But front man Joe Elliott and bass player Rick Savage rocked the Sheffield City Hall with their amazing acoustic versions as a duet for one night only at the Sincerely Sheffield concert. They also gave the 2000 plus crowd Leppard hits Two Steps Behind, From the Inside and When Love and Hate Collide. 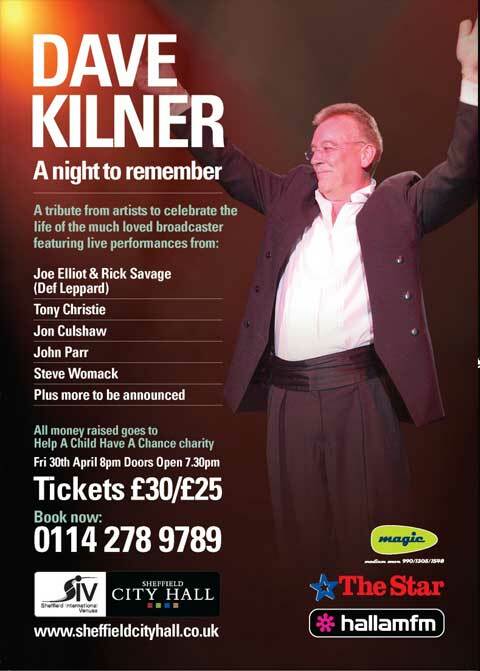 The show - raising thousands for Sincere Support, teamed them up later with other South Yorkshire superstars. Rock legend John Parr performed St Elmo’s Fire live for the 1st time in ten years, Paul Carrack entertained at the piano with How Long, The Living Years. Dance diva Kelly Llorenna wowed the 2000 plus crowd with her new single This Time I Know its for Real and a sensational version of U2’s What I’m looking for and her massive hit Tell it to my heart. Eurovision girl Lindsay Dracass delivered power ballads Somewhere over the Rainbow, I can’t make you Love me and Stevie Wonder’s Overjoyed. Other stars included Boy on a Dolphin, Acoustic Angels and John Reilly who had the crowd in tears one minute and dancing in the aisles the next. After eight years Bev’s dream came true, a momentous occasion of which she is very proud. Follow the photo’s and enjoy some classic “for one night only” memories of what turned out to be an outstanding feast of musical talent. © 2013 John Parr. All rights reserved.